umm you can try how eating unhealthy foods leads to sluggish and tired kids which leads to laziness in doing school work? CAMP CASEY — Have you been fertilized today? That was the question that Sandra Knight was asked by her mother throughout her life. 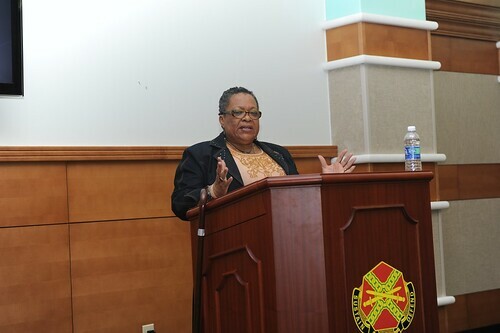 Knight was the keynote speaker at this year’s Area I Women’s Professional Development Symposium held at Camp Casey’s Community Activity Center, March 30. Knight, prevention coordinator with the U.S. Army Garrison Red Cloud’s Army Substance Abuse Program, spoke to those in attendance about the lessons she learned from her mother and how that empowered her throughout her life. This meant that you had to be able to keep score, which meant you needed to know how to do math. Her mother also taught her that in life as in any game, it doesn’t always go your way. For this reason you have to know how to read and “how to communicate, be able to study and prove your point of view, and be confident” in knowing what you are saying is correct. All eight of the children had jobs to help prepare them for life. Even the boys had to learn how to cook and clean so they wouldn’t have to depend on anyone else. One of Knight’s jobs was to start a fire in the family’s wood burning stove. “’I want you to learn how to make a fire so that you can stay warm. Because sometimes if you depend on a man you may freeze to death,’” Knight said her mother had told her. “My mom told me I was correct, but, when you read and study that is your fertilizer. It allows you to grow and be able to keep yourself strong so that this world won’t eat you up when things come to destroy you,” said Knight. “’I want to make sure that you get good and fertilized everyday and I want you to remember that you are never too old – you continue to grow, you continue to learn,’” she said her mother told her. Continuing to grow was the message of the day at the symposium, as presenters and guests alike tested their knowledge of women’s history. Quizzes made them break out their smart phones and delve into books to find out who was the first woman to run for President of the United States and who was the first Hispanic woman to serve as the U.S. treasurer. To help inform those at the symposium, Anthony Barkley, the Area I health and fitness facilitator, set up a display and talked about the health issues that women face depending on their ethnic background. To aid their health, Robert Gobble, Area I fitness director, lead the attendees in a 15-minute low-impact exercise session that they would be able to do in their work area or at home. He told them they don’t need a lot of time or equipment to stay healthy. Keeping one’s self healthy is good, but Knight believes that we need to help others as well. This digital document is an article from JOPERD–The Journal of Physical Education, Recreation & Dance, published by American Alliance for Health, Physical Education, Recreation and Dance (AAHPERD) on September 1, 2000. The length of the article is 5171 words. The page length shown above is based on a typical 300-word page. The article is delivered in HTML format and is available in your Amazon.com Digital Locker immediately after purchase. You can view it with any web browser. This digital document is an article from JOPERD–The Journal of Physical Education, Recreation & Dance, published by American Alliance for Health, Physical Education, Recreation and Dance (AAHPERD) on March 1, 1993. The length of the article is 614 words. The page length shown above is based on a typical 300-word page. The article is delivered in HTML format and is available in your Amazon.com Digital Locker immediately after purchase. You can view it with any web browser. From the supplier: Thomas K. Cureton was born in 1901 in Florida. At the onset, he showed an interest in physical activities, particularly in swimming and running. He received his bachelor’s and master’s degree in physical education at Springfield College and was appointed director of graduate studies. His published work, Physical Fitness, was regarded as a milestone in the literature of physical education. Cureton headed the University of Illinois Physical Fitness Research Laboratory from 1941 to 1969. Its scientific productions earned for him the title of ‘Father of Physical Fitness in the World’. This digital document is an article from JOPERD–The Journal of Physical Education, Recreation & Dance, published by American Alliance for Health, Physical Education, Recreation and Dance (AAHPERD) on August 1, 1994. The length of the article is 2369 words. The page length shown above is based on a typical 300-word page. The article is delivered in HTML format and is available in your Amazon.com Digital Locker immediately after purchase. You can view it with any web browser. From the supplier: Aquatic exercise programs are ideal for senior adults, particularly those with health problems. These programs offer elderly participants a way to engage in stimulating workouts while indulging in the pleasurable feeling of weightlessness. Aquatic exercises are usually conducted in the shallow end of a swimming pool and can be tailored to the needs of both swimmers and nonswimmers. They are ideal for therapeutic conditioning of the heart and lungs and also help to strengthen major muscle groups. More importantly, they promote self-esteem within a context of close social interaction. Title: Water exercise for senior adults – prescription for fun and fitness.